One of my dreams when I was young was that my parents would drop me by the side of the road (in this case, The Belt Parkway in Brooklyn, NY) and I would get on my horse and just ride away clear across the USA. Little did I know that, as far as the cross-country ride was concerned, another woman had beat me to it some fifty years earlier. Nan Jane Aspinwall was also born in New York, in 1880, but she spent most of her formative years in Nebraska where her parents were shopkeepers. By 1899, she was performing in burlesque as an oriental dancer by the name of Princess Omene, but by 1906 she had reinvented herself once more as ‘Montana Girl.’ With this moniker came a reinvented history—that she had been brought up on a ranch in Montana. Whatever the truth of the matter, she did manage to learn trick roping, stunt riding, steer riding, archery, sharp-shooting, and other rodeo show events, eventually gaining medals and becoming the highest paid artist in the combined Buffalo Bill Wild West and Pawnee Bill Far East show. Also in the show was husband Frank Gable, whom she had married around 1900. 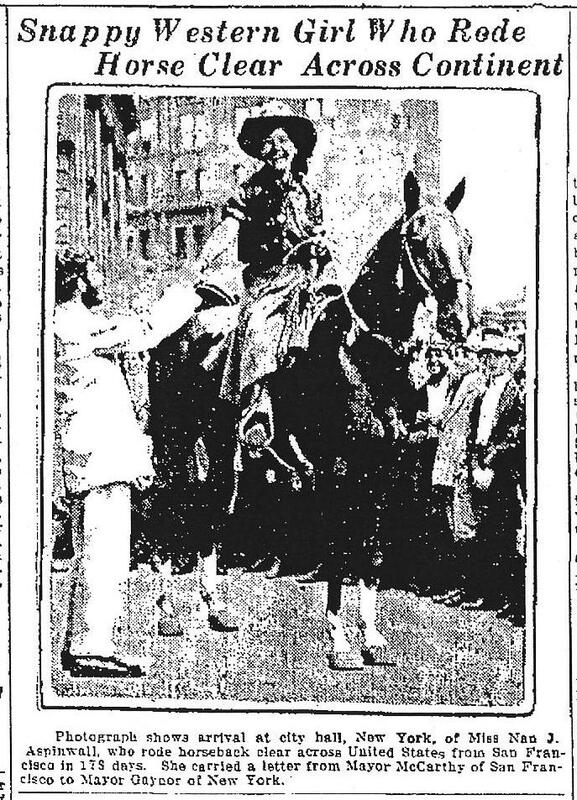 Apparently, it was on a bet from Buffalo Bill that she undertook the cross-country ride carrying a letter from the mayor of San Francisco to the mayor of New York. Going against advice to ride a sturdier horse, Nan chose instead to ride her Bay thoroughbred, Lady Jane. 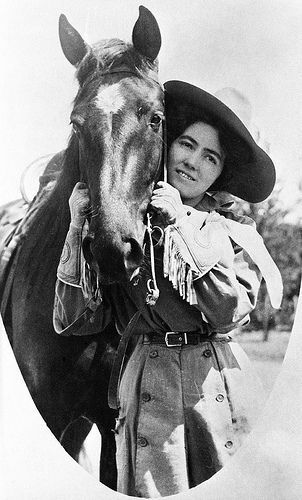 Now think about this: in an age when women were still not permitted in many states to ride astride, Nan, aged 31, undertook this ride of 4,496 miles, over some 180 days, alone and with full responsibility for her horse—whom she had to shoe some fourteen times herself. 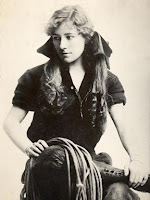 She supported herself by giving roping and riding demonstrations and hoping for hospitality, which was not always forthcoming. Two towns at least disapproved of her so greatly, that she shot off her gun in disgust. horses’ hooves had not left marks in the granite. She apparently rode aimlessly without food or water until nightfall and in the morning left Lady Jane to climb up a peak to try to get her bearings. It was only the horse’s whinny that let her find her way back to the mare. The next day she led Lady Jane to alleviate the horse’s burden, finally deciding to mount and let the mare lead the way—which the animal did, straight down a mountain into a railroad camp where Nan collapsed. This adventure cost her a week in hospital. She crossed the desert, sixty-five miles with only arsenic water available, in one day. At other times, she made as much as ninety-five miles a day, but from San Francisco to Denver she averaged forty-one miles a day and thereafter only twenty-seven. 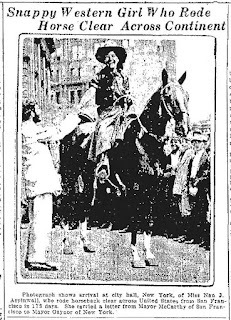 On July 8, 1911, Nan completed her journey, drawing a crowd to City Hall Park where she delivered the letter to the mayor. She also took her horse into the freight elevator and went up twelve flights! News articles of the day all mention the fact she was wearing a divided skirt, an item just coming into fashion according to the New York Times. Nan and Frank ran their own Gable’s Novelty Show after 1913, a sort of vaudeville Wild West show. Frank passed away around 1929 and sometime in the 1930s, Nan remarried to an Al Lambell who also predeceased her. For whatever reason, Nan removed herself from public life. She moved from Seattle, where she had been living, to southern California in 1954, apparently to be near a brother. She was childless, heavily involved with the Christian Scientist church, and spent her last seven years on a farm in San Bernadino, where she died in 1964. Nan’s amazing ride was immortalized both in a radio show and in a 1954 TV episode of Death Valley Days. At a time when nice girls rode side-saddle, and barbed wire had already cut across the country, Nan faced both prejudice and open hostility as well as the hardships of the elements and geography. It makes me think that perhaps that little daydream of mine might have turned into a night-mare. I have always loved her story! Really pretty amazing when you think about it! I'm still laughing at the image of little you with determination on your face being dropped off at the Belt Parkway! I've never heard of this woman before!!! I can't believe it. What amazing adventure. Of course, this is coming from someone who managed at get lost on a marked trail in the Badlands, about 20 yards from the parking lot. I'm so glad you brought this remarkable woman to our attention. I love the photos of her too. When you think of the fuss that was made over the ' Unbranded' crew who rode north from Tx up through WY and so on and what they encountered, 4 of them together with help along the way, this is truly a remarkable story. Altho' she did it in 1911 when there were fewer roads and buildings in the way, it still wasn't easy, to say the least. I'm fascinated. What a strong woman! And, yes, I was determined. . . but alas, a mite too young! Pluck, courage and determination. What a gal. Yes, Davalyn! Really amazing. And yet the things she was criticized for were riding alone (! ), not riding sidesaddle, and wearing a divided skirt! 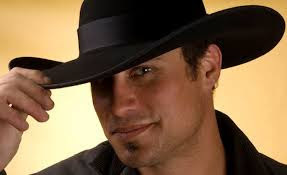 It seems I may have read conflicting reports and her horse's name may have been Lady Ellen. Apologies if I was incorrect.